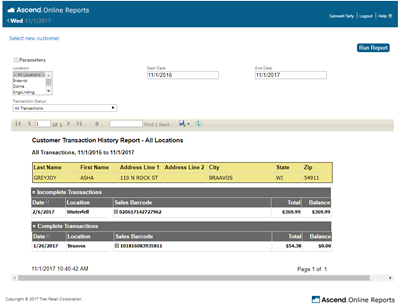 Ascend Online Reports are an excellent resource for additional Ascend reports. Many of these reports can even be run for multiple locations, if you're part of a multi-store chain. The Customer Transaction History report lets you search through all serialized items (for all your locations) for all customers. So a bike's history would show up in this report even if they bought it at one of your locations and had it repaired at another. 2. Click the AOR icon near the top of the screen. Your store's AOR portal will open in your default web browser. 3. Scroll to Customers and select Customer Transaction History. Once the page loads, you can select your search criteria from the dropdown menu on the left, and type in the relevant search text. The dropdown defaults to customer last name, but you can change to several other options, including serial number. Just click the Search Field dropdown and select SerialNo. you can also change the search parameters (such as changing it from “contains” to “begins with”). After you select your search criteria and fill out the search bar, hit Enter on your keyboard or click Search. The report will run and results will display below the search bar. Click on the appropriate customer name to open their record. Update the location to see their transactions at a specific store by selecting the location from the list near the left of the window. Modify the date range to see their transactions within the desired parameters. All the customer’s transactions that fall within your parameters will display below. You can expand a Sales Barcode by clicking on the plus icon to see the transaction details. If their transaction includes a serialized item, it will have the letter “P” or “R” directly preceding the serial number. P stands for purchase, and tells us that it was originally purchased at this location. If you see an R, it means that the serialized product was brought in as part of a Work Order during this transaction.